Lucrative designs have to combine functionality with attractive styling, and Honda has managed to create the near-perfect blend of these two necessary ingredients. Remembering that practicality and looking attractive don’t always like playing together, Honda has done a really good job of getting the mix right for the small Honda City car. A side on view has the high roof line balanced with a long curvy arc, suggesting that, inside, the cabin will be roomy. The roofline finishes off flowing into an elevated boot compartment that indicates good luggage space (590 litres). 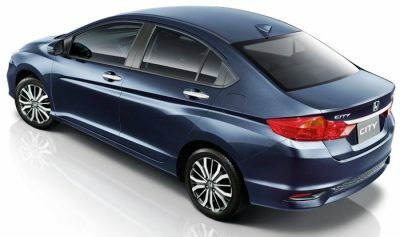 The updated and redesigned Honda City face has a more sophisticated look around the new LED headlamps, with the use of wider chrome surrounds in the grille and chiselled bumper drawing attention. Honda’s dart styling is aerodynamic and efficient, and no doubt the Honda City will slip through the air with little drag. LED DRL’s are standard, while LED tail lamps are available on higher trim models. The boot lid spoiler is nice and sporty. 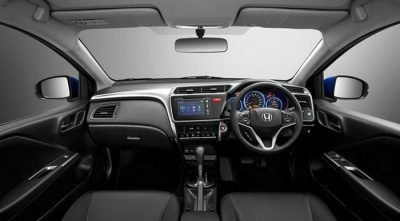 Inside the new City car, Honda has kept the nicely styled dash from the last model, however the dials are now back lit in white, and there is greater use of soft touch plastics to give the car a premium feel. More chrome detailing inside the cabin looks smart and sets the car up for matching and bettering some of the key small car rivals. Honda’s way with ergonomics has always been good, and it’s easy to get yourself comfortable inside a Honda. LED interior lighting for the cabin is a modern touch. The 7-inch touchscreen is really nice to use, clear on the eye and is based around Android software. You can even browse the web, live stream your music and connect to your phone for further enhancing your driving experience. 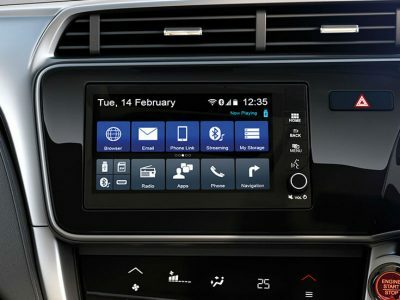 There is a host of features on the new infotainment touchscreen. Stylish interior design and high quality materials inside a car’s cabin need to be two inseparable companions. The benefit of this relationship is a resulting cabin that appeals to the occupants and lasts the test of time – two important components to a city car that might even be used solely for school and shopping duties for some. Commuting to and from work is another likely activity that a new Honda City will perform, so a happy commuter needs to be the end goal. Honda City has the goods for being a first class commuter. The space for front and rear seat occupants is right up with the best in class. You’ll also find the adjustable driver’s seat and steering wheel creates a good driving position for your frame with Honda making sure the City accommodates all sorts of driver shapes and sizes? Split folding rear seats also makes carrying longer items easy. If you’re in the business of carrying kids to school and back, then the squabbles will be made more manageable with Honda’s fine array of city car entertainment features. Of course, you can connect your smartphone through MirrorLink. USB, Aux-IN, radio and Bluetooth telephony along with start/stop button, automatic climate control with touch panel, rear AC vents, a reverse-parking camera and so-on should keep the kids amused. The three-spoke steering wheel has the controls for volume, telephone communications and the cruise control when opting for the luxury model. Honda’s magnificent ability to make your drive an efficiency marvel comes down to their ability to make zippy new motors that feel peppy and yet have a light drinking habit. Honda’s use of an 88 kW, 1.5-litre VT-i engine with 145 Nm of torque is the perfect match for the City. Blending good power delivery throughout the revs and modern VT-i technology provides the City with effortless performance around town and out on the open road. The Honda City is more than up for highway cruising, by the way. Owners will be more than happy with the fuel economy of the new Honda City car. You can expect below 6 litres/100 km around town, and even 5 litres or less per 100 km if you are cruising out on the open roads. These are excellent figures you’d have to say! Loads of boot space, efficient motors and lots of luxury features makes the Honda City a great car for longer excursions, too. On the road, the new Honda City has a ride that is comfortable and controlled, with Honda’s small car suspension more than capable of ironing out the bumps and creases in the city streets. Perfect for getting across town, the little Honda City loves to nip into car parks and snap at the heels of cars with a much larger bark. A sprint from 0-100 km/h takes just a smidgeon over 10 seconds, so you can see that the new Honda City, while not shatteringly quick, can be fun, too. The 2017 Honda City can be chosen with either a neat 5-speed manual transmission or the popular CVT gearbox with paddleshifters. The CVT runs with slightly better fuel efficiency than the five-speed manual. All-in-all, the 2017 Honda City is a step up, ensuring the rivals are kept in their place. For any more information on the Honda City or, for that matter, any other new car, contact one of our friendly consultants on 1300 303 181. If you’d like some fleet discount pricing (yes even for private buyers! ), we can submit vehicle quote requests out to our national network of Honda dealers and come back with pricing within 24 hours. Private Fleet – car buying made easy!